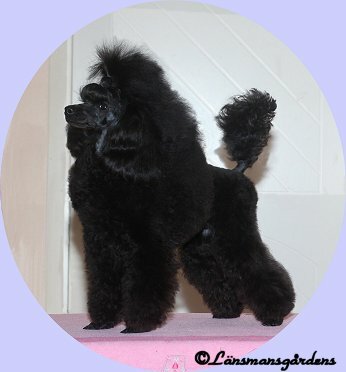 We have a small breeding of black, brown and white toy poodle and dwarf poodle in Sweden. On this site we will introduce our poodles, puppies and their pedigrees. You can also find pictures of puppies and adults. If You are looking for breedinformation, poodlehistory, various poodleclippings and more you can do a visit on our second poodlepage. It´s called "Alexandras Poodle Corner". I hope that You will find something interesting on our site and welcome back! This site has been visited by poodlefriends since 2001- 08- 03. Brake free from frames here! © Copyright, A. Wistrand 2001 och framåt, all rights reserved!